U.S. 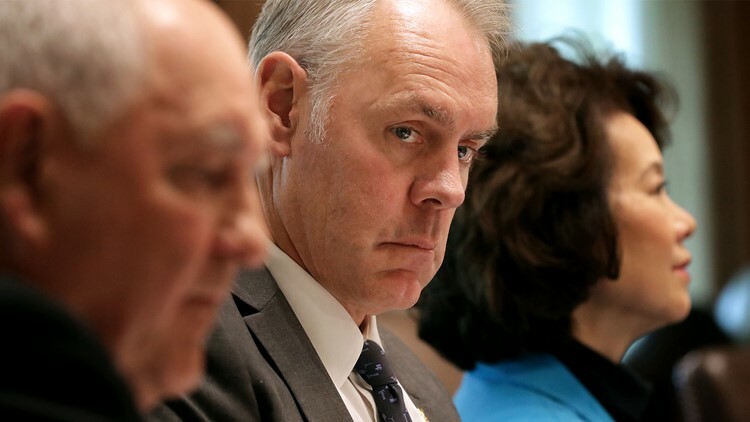 Interior Secretary Ryan Zinke (C)) attends a cabinet meeting with U.S. President Donald Trump in the Cabinet Room at the White House October 17, 2018 in Washington, DC. Ryan Zinke, the embattled secretary of the Interior, is leaving the administration at the end of the year, Trump said Saturday. Interior Secretary Ryan Zinke, facing federal investigations into his travel, political activity and potential conflicts of interest, will be leaving the administration at year's end, Trump said Saturday. In his resignation letter, obtained by The Associated Press, Zinke said "vicious and politically motivated attacks" against him had "created an unfortunate distraction" in fulfilling the agency's mission. Zinke got a warmer send-off from Republican Sen. Lisa Murkowsi of Alaska, head of the Energy and Natural Resources Committee, who said in a statement that he had been a "strong partner for Western states." Brown reported from Red Lodge, Montana. Associated Press writer Matthew Daly in Washington contributed to this report.